Jenbacher engines run on natural gas, biogas, landfill gas, coal mine gas, wastewater gas, syngas, and site-specific special gases. Commercial, industrial and municipal customers use GE Jenbacher products on-site for power, heating and cooling. Patented combustion systems, engine controls, and monitoring enable power generation plants to meet the strictest emission standards at the highest levels of efficiency, durability and reliability. Biogas and special gases are comprised of power plants that generate energy from landfills, wastewater, agriculture, coal mining, chemical plants and other industries. Gases with a wide range of heating values are converted into energy in these processes. 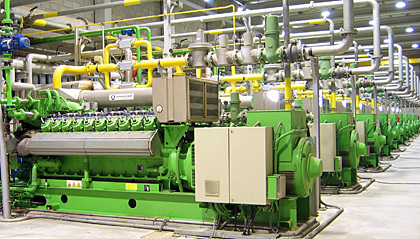 Power plants operate best when these gases are used simultaneously.The eco-friendly disposal of problem gases is a primary issue with gases in this category. Natural gas plants produce and deliver a decentralized energy supply using natural gas as fuel. Low in carbon and high hydrogen content, natural gas has a favorable carbon dioxide balance. For the same amount of energy, natural gas combustion produces 40-50% less carbon dioxide than that of a coal burning plant.